Want to rub leathers with the big boys and Girls in leather? Want to ask them questions and just hang out chatting? 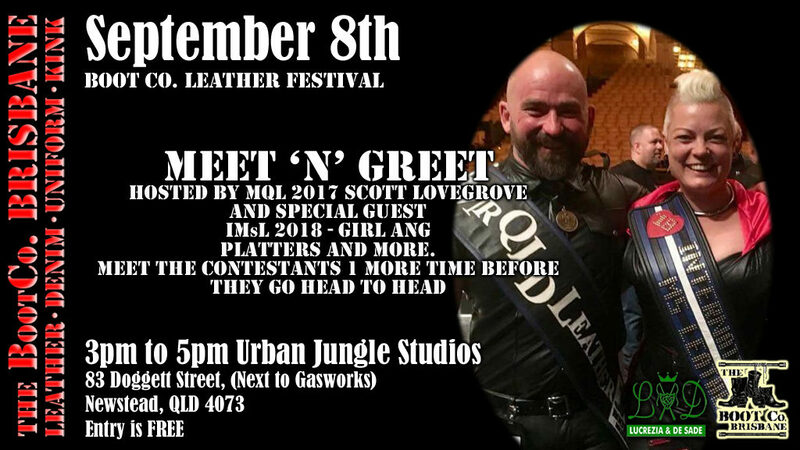 Then this is the event to be at, Meet and Greet with Current MQL 2018 Scott Lovegrove, other previous MQL title holders and the one the only International Ms Leather Girl Ang, along with the contestants and other people in the like minded community. The event is going to be held at Urban Jungle Studios down near gasworks in Newsted. 3pm till 5pm and entry is FREE!! This is the best place to start the celebration for Corium and is a must go to event, there will be some nibbles and drinks available, then after that head up to our biggest event of the year Corium 2018 where MQL2018 an d QLB2018 will be announced.